I don’t know if I’m crazy or normal, but I may hang stockings up for my dogs for Christmas…and I may also plan special meals for them on holidays…I might have also just purchased dog ice cream too. Crazy…? Yeah, probably. 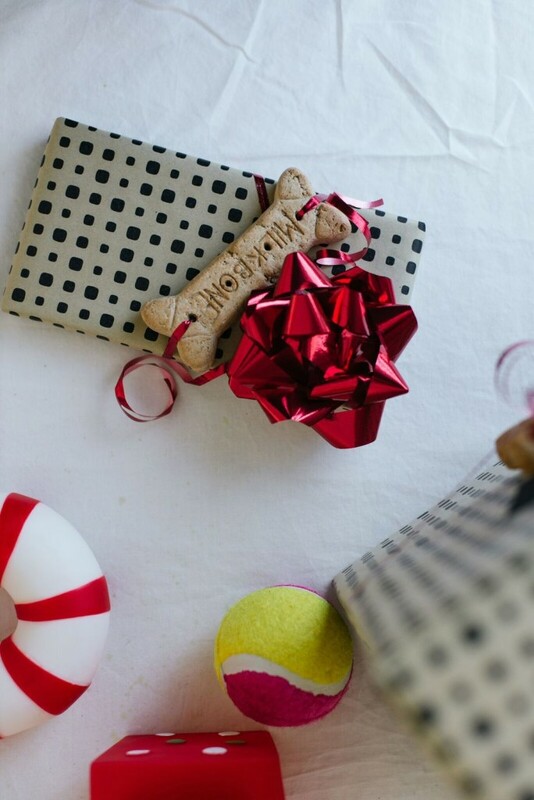 Either way, crazy or not, today’s post is a fun and easy way to add a little more pizzaz to your pet gifts this year for the holidays! 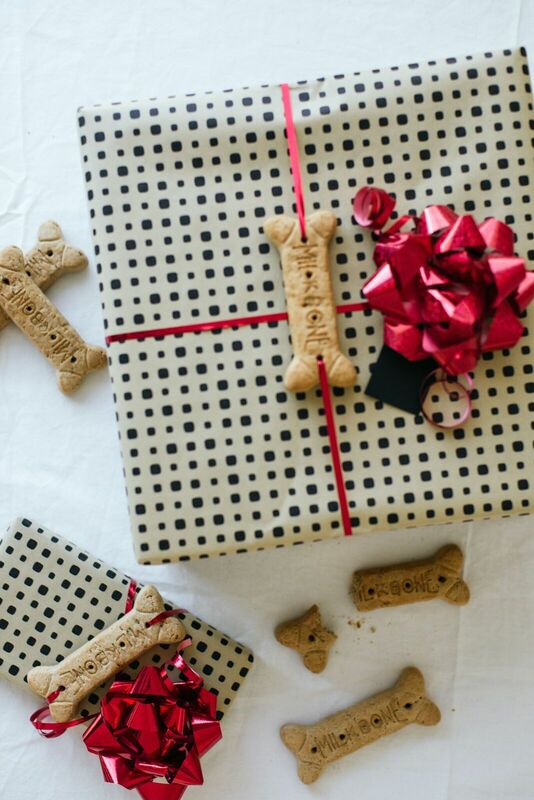 It also makes a really cute gift wrapping idea for and friends or family members with dogs too, because you don’t want to forget about them, right? This dog bone gift wrapping idea is fun and easy enough for anyone to do. 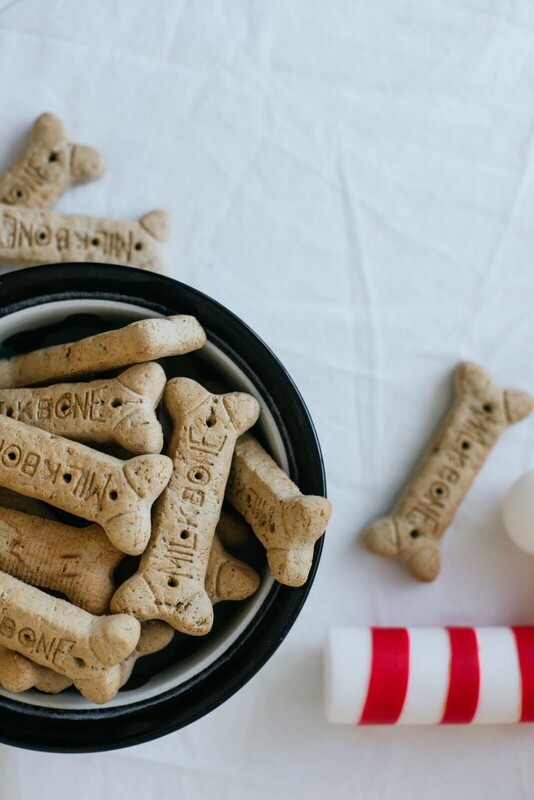 And you could even use your own homemade dog biscuit recipe if you’re feeling extra jazzy. 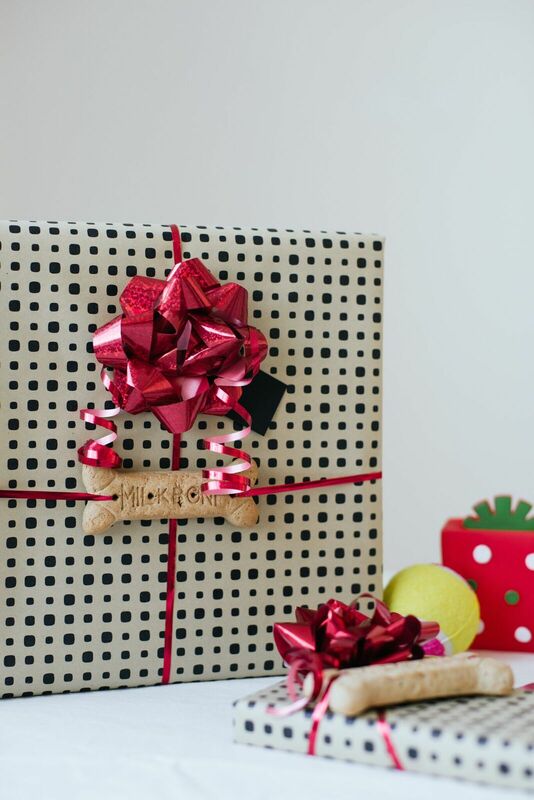 It’s a simple way to make your gifts look cute without investing tons of time or the thought behind it either. Definitely both things that help, considering next week is Christmas and I can’t be the only one starting to get a little bit delirious this time of year. 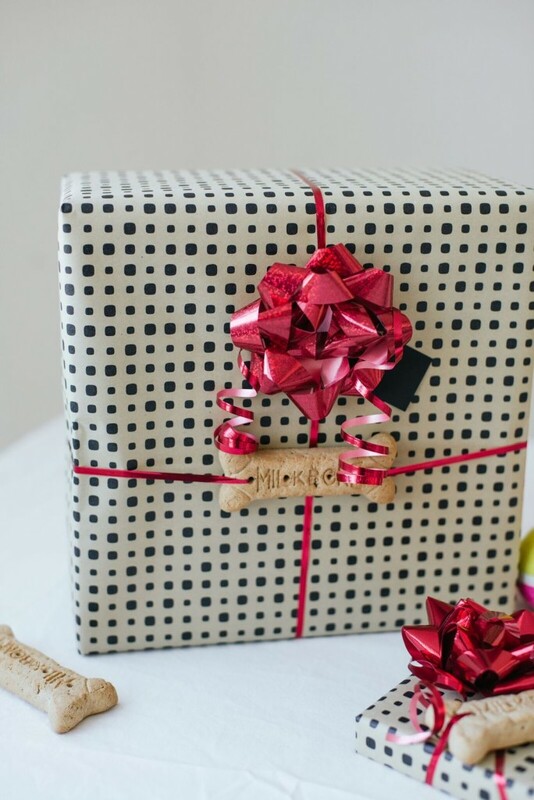 For this wrapping tutorial, there’s not really much to it. 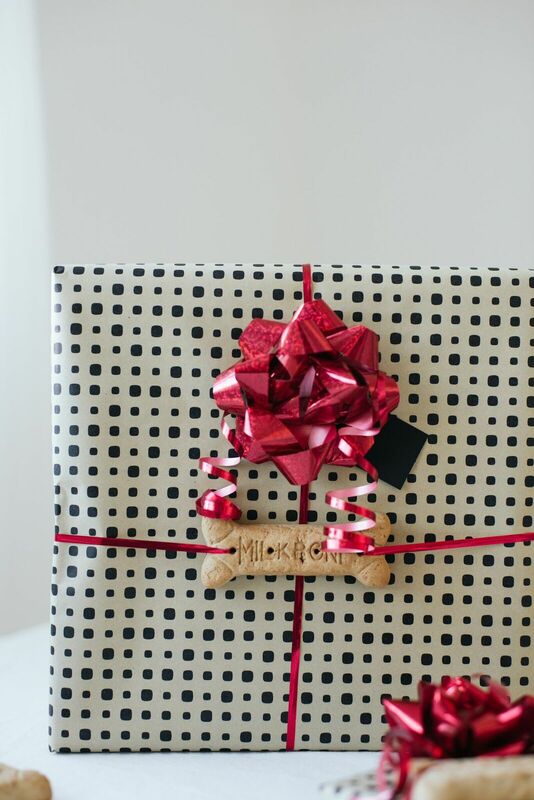 The wrapping part is pretty straight forward, so it’s mostly just some tips for making the process easier for you and sharing the inspiration I had for my pups! The first thing you’ll need to do, is to prep the holes in the dog bone. They do come with the holes pre-made in the biscuits, but they don’t go all the way through and it’s really tough to get any sort of string or twine in there without making them a little bit wider first. You’ll want to do this on the back of the bone, so that if you make a few mistakes or take a little bit too much off, you won’t be able to see it when it’s tied onto your packages. Use the pointy tip of a sharp knife to slowly widen the pre-made holes. Once you have a bit more room, use a toothpick to clear out any baked pieces that might be blocking the hole rather down. After the holes are widened, it’s time to string them onto your packages! I definitely started out wanting to use thick and pretty ribbon when I started this little project, but after many failed attempts and a lot of wasted ribbon, I realized that it’s definitely better to pick something that’s more pliable and small, like curling ribbon or baking twine. Trust me. It will save you lots of time!